A private road leads to this beautiful country manor where peace and quiet abound. Located among a large Amish community, the house is nestled on 85 acres of woods and pasture with hiking trails, biking trails, fishing hole and wildlife viewing. Perfect for a family gathering, large groups, girls weekend, corporate or spiritual retreat, wedding or a retreat vacation. There are six bedrooms, three large full baths and loads of room in this spacious 4200 square foot manor. There is an over-sized master bedroom with a king bed; a "great room" that has a king bed and a queen bed as well as two large sofa sets (that seat 8-10 people) and a TV- often used for the "kids room"; four bedrooms with queen beds; and two queen size convertible beds that are very comfortable. We also have a daybed/trundle bed which sleeps two and two queen size blow up mattresses available for large groups. There are 6 private bedrooms in the house, however, the "great room" is accessible only through another room. New Haven is a nature lover's paradise. There's plenty of bird watching (eagles, hawks, cardinals, etc), deer watching, bunnies galore, mushroom hunting, ginseng hunting, or you can simply relax on the front porch listening to the frogs and Amish buggies in the distance. You could also pick your own apples off our private apple trees and bake a fresh apple pie in New Haven's extra large kitchen. There's plenty of hiking and playing room too. You can play Bocce ball on the front lawn, hillbilly golf or have a picnic in the fields. Within minutes you could be on the Sparta Elroy bike trail, canoeing down the Kickapoo River, horseback riding, or enjoying Wildcat State Park. Many motorcycle enthusiasts enjoy the famed rural roads of the area, including those at Wildcat State Park. Fort McCoy offers paintball and laser tag and in winter they offer skiing and tubing hills. Skiing and snowboarding is also available at Mount LaCrosse Ski Area. Snowmobile enthusiasts can enjoy snowmobiling the many snowmobile trails in the area. In December, the Canadian Pacific Holiday Train is in the area. In the house you will find maps to activities including: Ontario, Wisconsin (for canoeing trips and tubing), Wildcat State Park (for hiking and motorcycling), Sparta (for golf), The Sparta/Elroy bicycling trail, local restaurants and grocery stores, and a specialty map detailing the Amish stores, bakeries and tours in the area. A scenic drive around the rural farms and covered bridges is a great way to enjoy a lazy day in the area. New Haven is a perfect retreat from Chicago (3.5 hours), Madison (2 hours), Wisconsin Dells (1 hour), Minneapolis (2.5 hours), La Crosse (45 minutes), Warrens Cranfest (40 minutes) and the surrounding areas. Conveniently located approx. 25 minutes from Tomah and Sparta, WI. New Haven is situated in the heart of the driftless region of Wisconsin, only minutes from Wildcat Mountain State Park, a State Park of Wisconsin. New Haven is now available for weddings! Inquire for further details. Wedding venue fees apply. **** New Haven may, at times, have cattle and/or horses on the property. If there is livestock on the property guests are not allowed in the fenced areas where the livestock are. The cattle and horses are not pets so you may not feed or attempt to pet them. Enjoy their beauty and company from a distance. * Daily or weekly housekeeping available from a local Amish family for an additional fee. Inquire if interested. * Catering available from a local Amish family as well as delivery of Amish baked goods, etc. Inquire if interested. * New Haven is equipped with high speed internet, however, this is a rural environment and may not have the speeds you are used to if you live in an urban area. Streaming movies and videos, via the internet, may affect performance for other computers and electronics using the internet at the same time. **New Haven has DirecTV cable. Watching DirecTV cable will not interfere with internet speeds as they are independent of one another. Includes 145+ channels but does not include local channels. *** New Haven is equipped with a hardwired land line. All three bathrooms include bathtubs and showers. Dedicated land line. Unlimited long distance in continental US. Linens are optional. If you would like Landlord to provide linens for your group, there is a $6/per person fee. Can provide linens up to 18 guests. Dining room table has seating for 6-8 people. There is another large table in the kitchen that seats an extra 8 people. So seating for 16 people between the two tables. DirecTv with over 140 channels. Local channels not available. Lots of books available for guests to use while at the house. Large collection of board games and movies. Large video library available for guests to use while at the house. 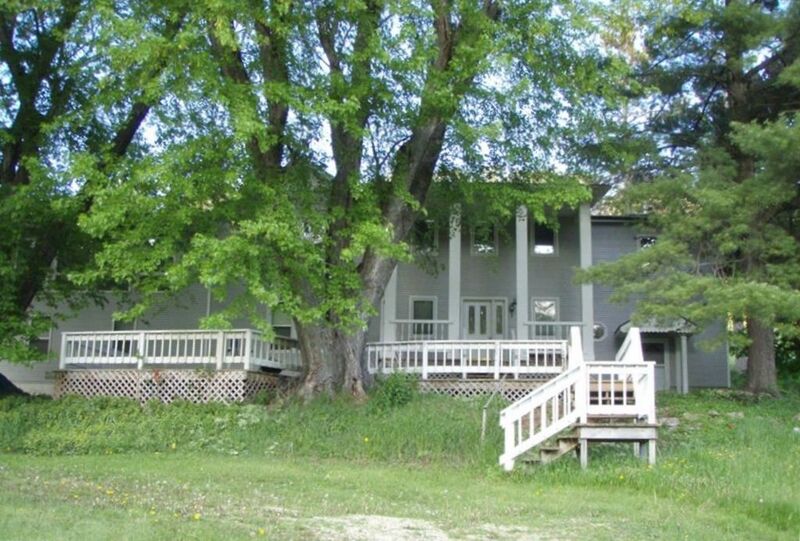 Available to rent close by (5 minutes) on the Kickapoo River. Great hiking at Wildcat State Park. Paintball & Laser tag available at Fort McCoy. Available close by with the Elroy Sparta Bike Trail accessible within minutes. Bicycles available for rent in Sparta. Available nearby at Fort McCoy. Along with a great sledding hill. Snowmobile trails nearby. There are many Amish places to visits. Bakeries, wood furniture, quilt stores, etc. Have fun canoeing down the Kickapoo River or taking the kids to the scenic playgrounds in Ontario and at Wildcat State Park. The older kids might enjoy paintball and/or laser tag at Fort McCoy. Horseback riding is nearby, amazing hikes through the beautiful Wildcat State Park and at the Kickapoo Valley Reserve. In winter there are a number of snowmobile trails and skiing, snowboarding and tubing at Fort McCoy and/or Mount LaCrosse. What a beautiful property! We went in the middle of winter (just last weekend) and enjoyed seeing deer in the yard and sledding on the hills. The other thing we enjoyed is each others' company! We had 23 people there one night and 12 of them were kids. But with so much space, it honestly never felt crowded. It was wonderful! Three bathrooms w/ showers and tubs (amazing), plus two eating spaces, plus a huge, open kitchen area, plus two tv's with seating. We played a slideshow by hooking my sister's laptop up to the HDMI port on one of the tv's. It was for my parents' 50th wedding anniversary, so there was literally a lifetime of photos (.jpgs) to go through. It was so fun to sit around with my siblings, parents, and kids/ nieces/ nephews. We played board games and card games, ate Girl Scout cookies, drank hot chocolate, did some sewing with Grandma, and talked. And laughed! As others have noted, the Wi-Fi, while present, was extremely slow. That didn't bother us! We weren't there to live on our devices. :) It was a great location to spend quality time together. My one caution is what others have said: it is hilly and rural and getting in and out of the property while it was snowing was a bit of a challenge for the folks with cars without 4-wheel drive. It was fine-- everybody made it-- but be prepared with things like salt / sand, floor mats, and use some good common sense. Have fun! We had a wonderful time with our family at this beautiful home in Norwalk. Owner was extremely responsive and very easy to work with! We stayed in this home for an extended family vacation where the main goal was to relax and enjoy each other's company. This house allowed us to do just that. The bedrooms were comfortable, the house was spacious and the kitchen was well stocked (making it easy to cook for a large group!). There were plenty of games, books and DVDs to use - our kids were even excited to see many games they enjoy! There is plenty of space in the house to get away and have some quiet time, but plenty of space for kids to run around and play. We arrived the night of a snow storm and would definitely caution you to bring a good vehicle that can handle snow on rural roads. The owner does a good job including that information in her welcome packet ahead of time - but we saw first hand why it was so important. As it is out in the country, the roads are not plowed immediately. But the plow came through early enough in the morning that we were able to get out and head to Fort McCoy for some tubing! Everyone loved our weekend here - would highly recommend it! We had a wonderful family weekend at New Haven, again! This was a return visit for our family gathering, and we had a wonderful time again! Everyone wants to make this an annual visit, as the house works so perfectly for our large family! Plenty of space for the grandchildren to run snd play, and quiet corners for those who want to relax or rest. Our family has grown since the last visit, and 23 of us (including 2 babies) had places to sleep, eat, bake cookies, play games and just enjoy being together. Sledding on the hills and star gazing at night were big hits! Everything in the house was perfect, clean and ready for us when we arrived. Thank you for sharing New Haven! The kids are already asking when we are going back to the big house! New Haven was a wonderful place for our extended family of 16 to be together for three days. This large home is situated in scenic Amish Country. The spacing of the rooms allowed for many groups to participate in different activities without distracting others. The youngest members of our family took over the great room, the adults gathered around the fire place, and we all spent time together in the spacious kitchen and living room for meals and games. We were delighted to find out that the large home was evenly heated and felt very cozy. It was also surprisingly sound proof. The owner was easily accessible and very helpful. We all enjoyed our stay in the New Haven Rental. Great place for my nephew you run around in. Quiet and peaceful place. WiFi is not the best. Space was perfect for our family. Beautiful area, lots of area to walk even in the winter months. The New Haven home worked out well for our family holiday gathering. There was enough room for a group to stay for 4 days without feeling crowded. It is definitely an older home and far away from any sizable towns, shopping or restaurants, so if staying here be prepared for the remoteness or a long drive through the country. The wi-fi is limited, so telephone service/computer/television is also limited. This is not a bad thing as long as you are ok with being somewhat unplugged. There were a lot of great books and games in the home to use to spend quality time together. The property is beautiful and had we stayed during nicer weather, we would have enjoyed exploring the area. Overall we had a good time at this home! The map above does NOT display the correct area. This property is located in a large Amish community. Approximately 5 minutes from downtown Ontario, WI and Wildcat State Park. Lots of Amish bakeries, shops and tours. Linens: Landlord can provide linens for your group. Linens are optional. A $6/per person linen fee for guests will be applied if you wish to have bedding and towels provided. Guests that provide their own linens will not incur any linen fees. There is a rental agreement for the house that guests must read and sign prior to any stay at New Haven manor. New Haven is NOT childproofed inside or outside so all children must be adequately supervised at all times. Wedding venue fee and deposit required. ** Approved pets welcome. Pet fee is $100 (and pet deposit is $100) for 1-2 pets. Additional pets considered. Pets MUST BE house trained, potty trained and well mannered. PETS MUST HAVE TRAVELED WITH YOU BEFORE, without incident, to know that they are good in unfamiliar places. Some pets are great at home but urinate, mark, etc when in a new environment. No smoking. Smoking is not permitted in the house or garage areas. Must be at least 24 years old to rent.